Our readers respond to Sundance, Utah Legislature and our new president. 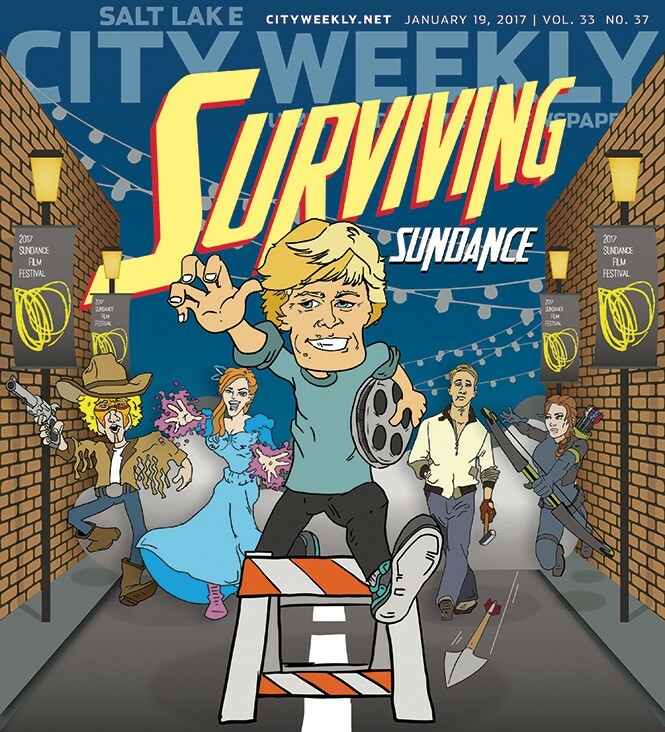 Cover story, Jan. 19, "Surviving Sundance"
Fun Sundance illustration on the cover of Salt Lake City Weekly this week. Will you survive?! Bring it on. Opinion, Jan. 19, "Trump's Words"
John, the answer to your statement, "I am trying to reconcile the fact that 62 million people disagreed with me and voted for him," is so obvious. It's simple; they are smarter than you! Blog, Jan. 20, "Graffiti inciting murder of now-President Trump appears on Main Street"
Grow up, idiots! I'm not happy that Trump is president, but this is beyond ridiculous and downright dangerous. This is saddening, to see people destroy property of others and saying they have the right. These people should be punished, for they have no regard for the law or the land. Way to show what a good community we are. Can we just please stop the hate? Graffiti is the voice of the people most often silenced. Just signifies the kind of people opposing Trump ... scum. Blog, Jan. 20, "Hundreds take to Salt Lake City streets to protest Trump"
The beginning of a movement. I didn't expect to see hundreds of thousands of people in cities all over the world protesting this administration. All change in America's modern history was started with a protest. Any American with at least a third-grade education would know that. Blog, Jan. 23, "Massive protest floods Capitol Building on first day of Legislature"
A&E, Jan. 19, "A Hard Reign"
Excellent piece, as is your film. "I have long said that we should have kept the oil in Iraq. ... In the old days, when we won a war, to the victor belonged the spoils." These are the words of the most powerful man on Earth. It goes beyond bitter partisanship to realize this is clearly a slap in the face to our brave men and women who served and lost their lives in Iraq. Two of my sons served in the Iraq War. It tells them that it's all about monetary gain and that there is absolutely nothing wrong with America being the world's bully if it wants to be. This is not the way I was raised to think of the country in which I live. Cover story, Jan. 12, "Legislature Madness"
It is puzzling City Weekly neglected to include H.J.R. 3 Joint Resolution calling for a convention to amend the constitution of the United States in the article on upcoming legislative bills. Article 5 of the U.S. Constitution empowers future generations to amend the 1789 U.S. Constitution as needs arise—27 single subject amendments to date. Republicans and Democrats both are complicit in nearly doubling the national debt since 2008 to $19.3 trillion. This requires 33-42 percent of federal income to pay merely the interest. Another third is waste and corruption with one-third, or less, to run the country. Secondly, the scope and power of federal government has expanded exponentially through extra-legal regulations made by unelected bureaucrats in ever-proliferating agencies. The Article V Convention of States Joint Resolution (H.J.R. 3) sponsored by Merrill F. Nelson is to support amendments to the U.S. Constitution: 1. fiscal restraint on federal government, 2. limiting power and jurisdiction of federal government and 3. limiting terms of office for its officials and members of congress. Convention commissioners are agents of their respective states and can be recalled if any renegade seeks to take action outside the topics defined in the 34 state applications to call the convention. Even quicker, other delegates will also reject the new topic as out of order. When 34 states apply, Congress must call a convention and has no control over the delegates. A statesman commented where greed and power reside there breeds corruption in our federal government. Please sign the petition online at COS Action and encourage your legislators to support H.J.R. 3 to curb federal government. Correction: Last week's opinion piece [Jan. 26, "Jason Jarred"] said Congressman Jason Chaffetz applied to and was rejected by the CIA. It was in fact the Secret Service.